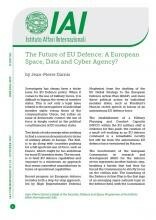 Sovereignty has always been a tricky issue for EU Defence policy. When it comes to the use of military forces, it is difficult to bypass the views of member states. This is not only a legal issue related to the prerogatives of individual member states versus those of the communitarian Union, but rather an issue of democratic control: the use of force is deeply rooted in the political constituencies of EU member states.